3M believes that robust, reliable and easy to use Hot Melt application equipment is key to achieve high productivity, high quality, and long term satisfaction of operators. For these reasons 3M has concentrated on offering the ideal range of applicators to meet your application and production needs. 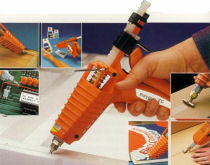 Glue guns come in low-temperature and high-temperature (hot-melt) versions.